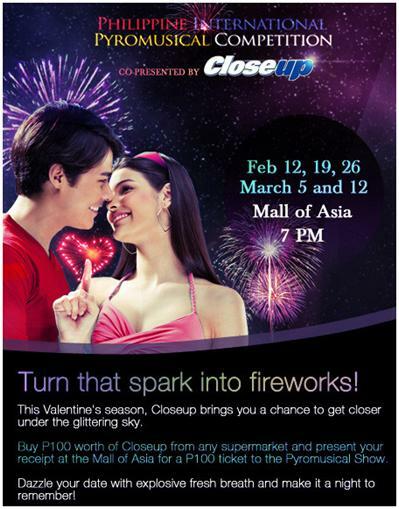 Buy P100 worth of any Closeup product from any supermarket this 2011, and get a FREE P100 ticket to the Pyromusical Show. Present official receipt to designated Closeup ticket booths at the SM Mall of Asia. Only official receipts of purchases made starting January 1, 2011 will be accepted. The closeup brand and purchased amount must be clearly indicated in the official receipt. Multiple receipts will be accepted. Every P100 purchase of Closeup is equivalent to 1 ticket. The number of Closeup tickets to be given will be based on the total purchase amount of the accumulated receipts.